Maya Songbird: New Age Women on the Go...#CamperBabes Part Two..
New Age Women on the Go...#CamperBabes Part Two..
Ok. As Promised. We are back with Part Two featuring Ily Cortez Aka Ily Queen. So this is so cool. I met Ily through my friend Amelia aka AMRA, while in LA and when we Journeyed back to take Ily home after a fun day of rehearsal for a show we had together. Low and Behold She had a glorious and groovy Camper. I said, "Wow, ILY! 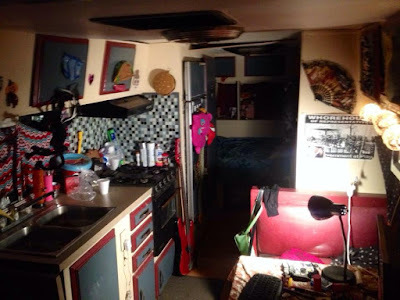 I have another friend who lives in a cool camper just like you and I plan to write up about her life living unconventional in a camper to inspire women to branch out on their own camper adventure. I want to feature you also." And so now we are here!Ily is going to take us into her world of unconventionalism and total #camperbabe power. Enjoy. What inspired you to live such an unconventional life in an RV? What inspired me to live an unconventional life the most was Honestly my love for music for creating as a musician, writer, and artist and the punk movement and music specifically the anarcho/beat punk movement and anarchist squatter free punk lifestyle. Anarchist literature from all over the world inspired me and gave me knowledge to know that you don't have to enslave yourself to meet societies requirements and expectations. Also Quiet frankly, I was a musician working an office job 9-5 Monday thru Friday and one day I woke up and said I don't want to spend my life and youth like this. Life's too short to not do the things that make me ultimately happy in life. From that moment on I decided to "get out" of the routine that the system has and throw everyone's opinion about what's right and wrong and what a good citizen should do out the window and decided to free myself. I've never been happier. How long have you lived in a RV? Do you plan to travel more with your RV? Definitely! Another reason why I decided to purchase my rv is because I realized Im young and I have not traveled enough and it's time to start doin just that! Also I'm planning on using it for touring purposes for my band "CXA". Whenever we decide to do a DIY tour that is. Living rent free! Only requires maintanence every now and again and gas to get around. You can drive anywhere and anywhere can be your backyard or front yard! Rvs are cozy. Not costly at all. What are some of the hardships? You gotta switch up the parking by moving forward or backward every once in a while so parking enforcement doesn't get on your case. You gotta clean the waste tanks every once In a while like twice a month at least. If you do it on the street make sure you have access to water and it's at a time where no one can see u. You have to be selective about where you station (park) gotta make sure it's safe and that you can get electrical hookups and water cause it's an rv if you need electrical and water you need a hookup ! Any inspiring words to ladies who might want to become an RV living girl? I think that the most important person in life is yourself. As long as you know the value of your own life just know you can do anything in life you don't have to be tied down to any type of lifestyle because you're a woman. Yes living in an rv can be risky and it's not the easiest thing in the world either. But what In life is easy? Anything can be a task in life and if it can be done it can be done and it can be the best thing ever if done right. Well there you have it. What more better way to convince you to try something new and dance while doing it. I hope you are inspired to think outside the box on your path and live your life how you please. I hope if you are a woman who has read Part One and Two of the #CamperBabes Story, that you are inspired to live a super independent and unconventional lifestyle. Meaning you are the author, editor, and director of your life. 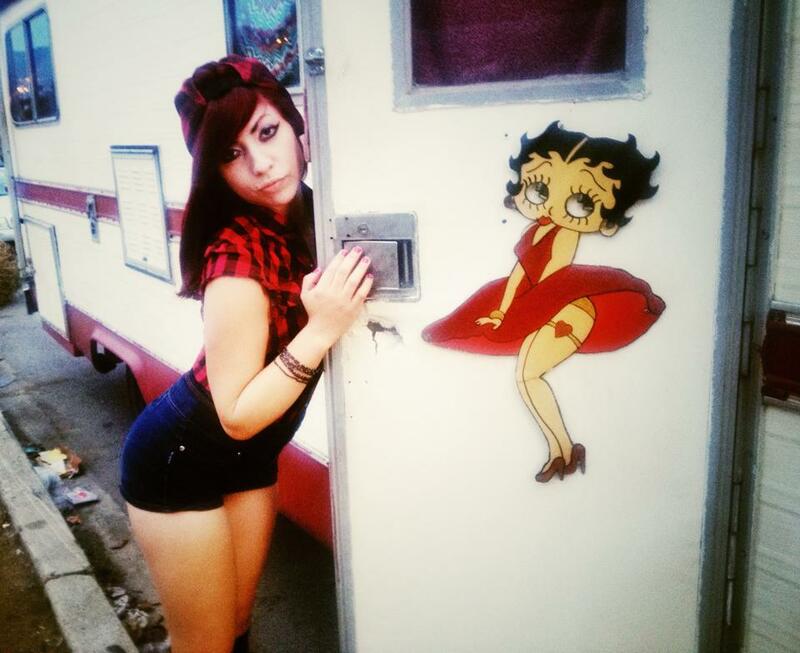 Thank you so much Ily for sharing your #camperbabe life with us. Peace and Unconditional Love to all readers. Wishing you lots of Rainbows and Sunshine along the path.